Tattoos are more common than ever. It is now estimated that 21 percent of adults have tattoos, and approximately 36 percent of those ages 18-25 have them. Before getting a tattoo, one must consider many things, including the health risks. Using unsterilized or used needles and equipment can cause serious health problems, such as HIV and hepatitis. 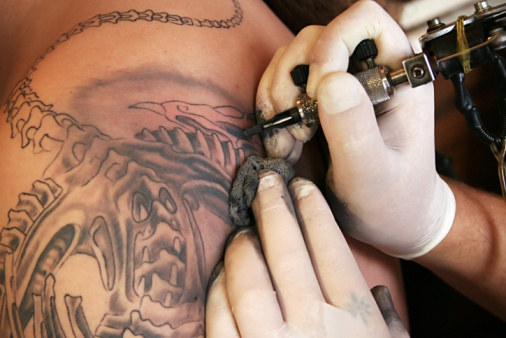 Even if everything is sterile however, there are still risks associated with getting a tattoo. Tattoo sites can easily become infected when contaminated or expired ink is used and enters the bloodstream. The first signs of an infection usually take place two to three weeks later. Red rashes, swelling, pain, and a pus-like discharge are all common early symptoms of an infection. Pain, fever, chills, and sweats can develop if the infection is not treated. A doctor can prescribe antibiotics to treat an infection. An allergic reaction to the dyes used in tattoo ink is another cause for concern, specifically the red, blue, yellow, and green dyes. Some people are allergic, but don’t realize it until after they get a tattoo. An allergic reaction can result in an itchy rash or skin bumps at the tattoo site. Allergic reactions can occur immediately, or several months or years later. Other potential problems associated with tattoos include keloid scarring and sensitivity to MRI exams. Go to a registered tattoo parlor with licensed tattoo artists. Your tattoo artist should have a clean work space and be wearing disposable gloves. Medical grade disposable needles should be individually wrapped in a sealed package. Inquire about the expiration date of the ink. Make sure inks being used are approved for tattoos. See a doctor immediately if you think you have an infection. May is Hepatitis Awareness Month. Many forms of hepatitis are preventable and can be treated if detected early. Deciding to get a tattoo is an important decision and should not be taken lightly. You should be informed to make the best decision and do what is safe and best for you. May 31 is World No Tobacco Day. Know the dangers of exposing your family and friends to secondhand smoke.Secondhand smoke is a combination of side stream smoke-which comes from the end of a burning cigarette and mainstream smoke-which is exhaled by the smoker. It may seem harmless but the smoke that comes from the end of the cigarette is considered to be even more harmful than the smoke inhaled by the smoker; because there are no filters. Secondhand smoke is harmful to everyone; however, pregnant women, children and partners of people who smoke are the most vulnerable. There are over 250 harmful chemicals that can be found in the smoke created by tobacco products. Some of these chemicals are carbon monoxide, hydrogen cyanide, ammonia, arsenic, vinyl chloride and formaldehyde. The Environmental Protection Agency categorizes secondhand smoke as a Group A carcinogen; meaning that it can cause cancer in humans. The more you are exposed to secondhand smoke, the higher your risk of developing diseases and suffering from the health effects. Respiratory symptoms such as wheezing, breathlessness and coughing can be triggered by secondhand smoke. Other harmful health effects include the increased risk of developing heart disease, respiratory disease and strokes. Pregnant women who consistently breathe secondhand smoke may have miscarriages or give birth to low birth-weight and premature babies. For newborns exposure can escalate the risk of Sudden Infant Death Syndrome. Children can experience increased occurrences of asthma, pneumonia, bronchitis and ear infections. Secondhand smoke is harmful, despite the level of exposure. Breathing in even a little smoke can be dangerous and the effects on your health can be immediate. There are several ways to reduce the risk of exposure to second hand smoke. You can ask members in your family not to smoke in your home, disallow smoking in your car and choose smoke- free restaurant and indoor places. Headphones are popular for a multitude of reasons, such as convenience and sound quality, but there is a downside to these devices. According to The Journal of the American Medical Association, the number of teens who have experienced hearing loss has increased by 33% since 1994. Do you catch yourself blasting music while listening to your headphones for long periods of time? If so, your hearing may be at risk. 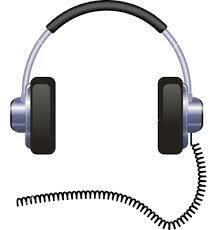 Headphones come in a variety of styles, but the two most commonly used are earbuds and around-ear headphones. While around-ear headphones can have negative side effects, earbuds are the more dangerous because they are inserted directly into your ears, providing an uninterrupted route for the music to travel through your ear and straight to your eardrum. When sound enters the ear, the eardrum vibrates. These vibrations travel to the cochlea, where fluid carries them to fine hairs that trigger the auditory nerve fibers, which travel to the brain. When a sound is too loud, the hairs can become damaged, causing permanent hearing loss. Noise is damaging at about 85 decibels, or the volume of a hair dryer. People who tend to play music up to 110-120 decibels over a long period of time while using earbuds, which increases the sound by 7-9 decibels, can experience a significant amount of hearing loss. • Listen to your music for no longer than an hour and no louder than 60% of volume. • Purchase around-ear headphones with noise-cancelling technology so you can avoid blasting music and prevent music from having direct contact with your eardrum. • Remove earwax. Earwax builds up every time you push earbuds into your ear canal, so make sure you gently clean it out to prevent hearing loss, discomfort and infection. If you’re experiencing hearing loss, please call Flushing Hospital Medical Center’s Ambulatory Care Center to schedule an appointment with an ENT at 718-670-5486. What are the Risk Factors and Symptoms of Childhood Asthma? Did you know that asthma is the most common, chronic,childhood disease? It’s more commonly found in children who live in urban areas and more prevalent in African Americans than Caucasians, and in males more than females. Asthma often runs in families. 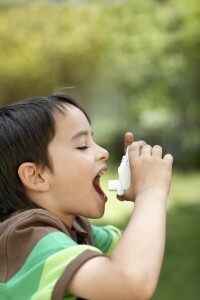 Children who have brothers, sisters or parents with asthma often will have asthma themselves. 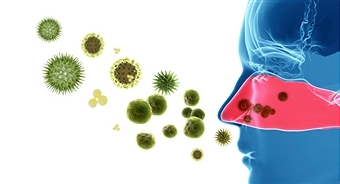 Asthma can also be caused by certain types of allergens. The Ambulatory Care Center at Flushing Hospital Medical Center offers a full range of pediatric allergy and asthma services. Please call 718-670-5486 for an appointment. Obesity and Arthritis: What is the Relationship? When asked what health problems are directly attributed to obesity, the most common answers are hypertension, heart health, and diabetes, but obesity has a large affect on another condition – arthritis. May is Arthritis Awareness Month, and according to the Centers for Disease Control and Prevention (CDC), one out of five Americans has been diagnosed with arthritis, but that number nearly doubles among those considered obese. Obesity not only raises the risk of getting a certain type of arthritis; but for those who already have arthritis, obesity makes the condition worse. Here’s a look at what fat does to arthritis, as well as some tips to put you on the road to losing weight. Osteoarthritis (OA) is the most common type of arthritis, affecting approximately 27 million Americans. It is characterized by the breakdown of cartilage – the flexible but tough connective tissue that covers the ends of bones at joints. Age, injury, heredity and lifestyle factors all affect the risk of OA. OA has a logical link to obesity: The more weight that’s placed on a joint, the more stressed the joint becomes, and the more likely it will wear down and be damaged. 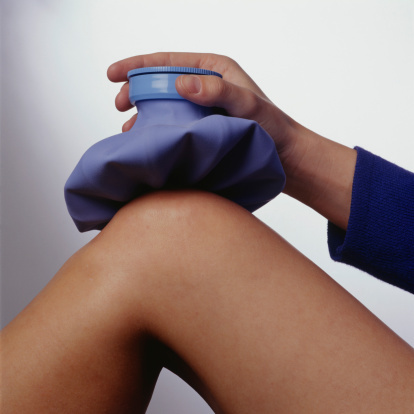 Every pound of excess weight exerts about 4 pounds of extra pressure on the knees. So a person who is 10 pounds overweight has 40 pounds of extra pressure on his knees. If a person is 100 pounds overweight, that is 400 pounds of extra pressure on the knees, causing those who are overweight to be at greater risk of developing arthritis in the first place. Once a person has arthritis, the additional weight causes even more problems on already damaged joints. Flushing Hospital Medical Center offers nutritional clinics to help those looking to loose weight and avoid developing osteoarthritis, as well as full range of barriatric surgery options performed by doctors using the minimally invasive da Vinci robotic system. Barriatric surgery performed using the robot allows for faster healing time, less scarring, and shorter hospital stays. For more information call 718-670-8908. Can You Guess How Far A Sneeze Travels? The spray from a sneeze can travel distances of up to five feet and speeds of 100 miles per hour. To prevent the spread of germs always cover your nose when you sneeze. Have you tried hot water and lemon? 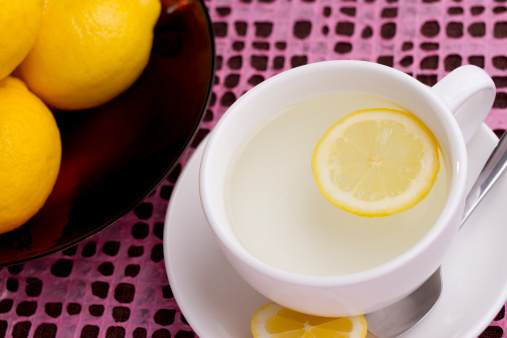 Nutritionists and celebrities alike are raving about the benefits of drinking a single glass of hot lemon water 15-30 minutes before breakfast. Use the juice of half a lemon per 8 oz. cup, or adjust the lemon for your personal taste. It will not only help you stay hydrated, but it may also improve digestion and relieve symptoms of indigestion.
. Gives your immune system a boost – Lemons are packed with nutrients including vitamin C, B-complex vitamins, calcium, iron, magnesium, potassium, and fiber. The vitamin C in lemons can help alleviate stress and fight viral infections and sore throats. Potassium is beneficial to heart health, as well as brain and nerve function.
. Reduces inflammation and cleanses the system – Drinking lemon water regularly decreases acidity in your body and removes uric acid from joints. It enhances enzyme function, stimulating your liver and activating bile flow, which helps emulsify and flush out fat soluble toxins.
. Keeps your skin blemish-free — The antioxidants in lemon juice help decrease blemishes and wrinkles.
. Helps you lose weight — Lemons contain pectin fiber, which assists in fighting hunger cravings. A potential drawback is that the citric acid in lemon juice could erode the enamel on your teeth. To prevent damage make sure the water is lukewarm, not steaming hot. You can also drink through a straw so it bypasses your teeth, and rinse your mouth with water immediately after drinking. Wait 60 minutes after drinking to brush your teeth. There are myriad benefits to drinking more water. Adding a cup of hot water and lemon to your morning routine will help you do that. You may have heard a lot about probiotics recently, but what exactly are they? Probiotics are live organisms, specifically beneficial bacteria, that live in your intestines and help process indigestible fibers and keep bowel function regular. They produce a number of vitamins, including B6, B12, and K2, and aid in the absorption of minerals such as iron, calcium, and magnesium. Probiotics are found in yogurt, kefir, milk, and in fermented foods like sour pickles, sauerkraut, kimchee and miso. They can also be taken as over-the-counter supplements. So what’s the deal with prebiotics? 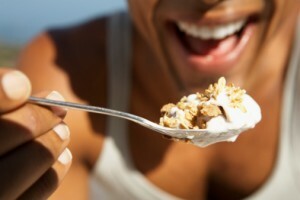 Prebiotics are non-digestible carbohydrates that act as food for probiotics. Prebiotics are found in whole grains, bananas, onions, leeks, garlic, honey, asparagus, soybeans and artichokes. When probiotics and prebiotics are combined they form an interdependent, beneficial relationship. One is the live bacteria and the other is the fuel needed to thrive. Side effects are rare, and most healthy adults can safely add foods, or supplements, that contain prebiotics and probiotics to their diets. If you’re considering taking supplements, check with your doctor to be sure that they’re right for you. Many people gain a few pounds when they quit smoking, some more than others. Research has shown that, on average, individuals can gain between two to 10 pounds once they stop smoking. This, however, shouldn’t affect your decision or effort to quit smoking, since weight gain is dependent upon your eating habits and your level of physical activity. There are a several reasons why people gain a few pounds after they stop smoking. Smoking is known to increase the body’s rate of metabolism, which helps burn calories. Once someone stops smoking, their rate of metabolism may slow down, lessening the amount of calories they burn throughout the day. Over time this could lead to a weight gain. Also, people who smoke tend to have an oral fixation. When they stop smoking, the act of chewing usually replaces the oral fixation for smoking and most people find themselves eating more. In addition, smoking also acts as an appetite suppressant, which also causes a person to eat more frequently once they stop the habit. Weight gain is a real concern for people desiring to kick the habit but fortunately, it can be minimized or completely avoided. The damage smoking causes the body is far greater than adding a few extra pounds. The decision to stop smoking can be the first step to leading a healthier life. Speak with your teen about these changes, approach them in a direct but calm manner. Ask them questions about changes that may be occurring in their lives, as well as questions that may uncover drug use. If your teen admits to using drugs, it is advised not to display anger but to rather show your support in finding them help and express your concern for their safety. The next step is to immediately seek treatment from a mental health professional, drug treatment program or a qualified therapist.